While it's hard for many pet parents to fathom, dogs are susceptible to sudden accidents and medical emergencies. Accidents can happen to any dog regardless of how sheltered they are. When the worst case scenario happens, knowing what to do can make all the difference in the outcome. Unfortunately, many owners aren't prepared for a sudden crisis. In some cases, you have very little time to make a rational decision that can help save your dog's life. Luckily, there are several steps you can take to ensure that you're prepared for anything. The first thing you should do is remain calm. It's in your dog's best interests and can help you make the right decision on how to proceed. You should always call a veterinarian as soon as possible. 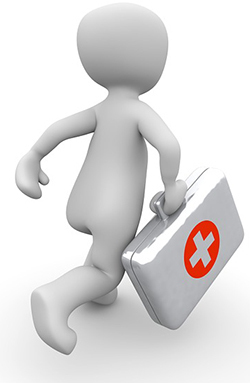 First-aid care, while important, is no substitute for professional assistance. Trained veterinarians will be able to provide your pooch with the medical care they need. With that being said, it's not always possible to get to a veterinarian's office at a moment's notice. If that's the case, you need to act fast to minimize pain and damage. It should be noted that your dog may act very differently when they're injured. Your pooch will be scared and alert. It's not uncommon for dogs to act aggressively to loved ones. Before you touch them, make sure that they're being passive. Crouch down to get to their level and say their name gently. You should only make contact when they're comfortable. At that point, it's good to assess your dog's condition. Pay attention to his consciousness and breathing. If possible, take a look at his gums. They're a great indicator of a dog's overall health. Pay attention to any abnormal colors. Also, take note of any bleeding on your dog's body. All of this information can help you administer first-aid care and give your veterinarian a better idea of the situation. Here's a list of common emergencies that dogs face. While it's not exhaustive, this basic guide can help you create an emergency care plan that can help to save your furry friend's life. Whether your dog is injured by an open flame or exposure to chemicals, it's imperative that you provide care as soon as possible. Start off by creating a muzzle. Not only will this help you stay protected, but it will also prevent your pooch from licking the wound and making matters worse. From there, you should flush the wound with water. This can help soothe the pain. In the case of chemical burns, the water will also help to prevent the issue from getting worse. With severe injuries, utilize a cold compress. Wrap ice cubes in a thick towel and apply the compress to the wound. If your dog is drowning, you need to act quickly and get them to dry land. Lay your dog on their right side and straighten their head to create a direct air passage from their lungs. Then, check to see if they're breathing. Pay attention to their chest. You should also listen to their heartbeat and check for a pulse. You can then administer CPR. Pump the widest part of their rib cage. It's important that you don't pump directly over the heart. Do this at a fast pace of approximately 15 pumps per 10 seconds. After one set of pumping, place your hand over their muzzle to seal their mouth closed. Then place your mouth over their nostrils and blow gently until you notice their chest inflating. Repeat the process until your dog is breathing and has a steady pulse. Once they've been resuscitated, bring them to the vet. Fractures can occur due to physical trauma like a car accident or by simply falling down the stairs. If this ever occurs, your goal should be to get your dog to the vet as soon as possible without agitating the injury. Lay your dog on one side and use a stretch for transportation. If they are able to walk, you can also fashion a sling with a blanket. As stated before, dogs can be very anxious after suffering a serious injury like a fracture. You may need to create a muzzle to keep yourself and your dog protected. One of the most common hazards that dogs will face is moving traffic. In many cases, accidents like this occur in residential neighborhoods close to the dog's home. They may escape the confines of a fenced-in yard or get loose from their leash. The trauma experienced by dogs will vary based on a number of factors. These include where the dog was hit, how fast the vehicle was going, and much more. Injuries can be as minimal as a few bumps and bruises to severe trauma like broken bones and internal hemorrhaging. Whatever the case may be, the first thing you should do is to get the dog to safety. It's important to pull them to the side of the road away from moving traffic. At that point, you need to assess their behavior and condition. It's recommended that you create a makeshift muzzle to protect yourself from instinctual biting. You can use a belt, towel, or part of their leash. Before you do that, it's important that you make sure they have no issues breathing. You need to lift them carefully to your vehicle and head to a vet. Depending on their particular injury, you may want to create a makeshift stretcher with a sturdy blanket. Insect stings should be taken very seriously. While most dogs won't have a problem with a single ant bite or bee sting, some dogs are very sensitive to insect venom and experience an intense allergic reaction. If your dog was attacked and stung multiple times, the effects only get worse. You should get to a vet as soon as possible. In the meantime, clean the wound and remove any stingers that were left behind. Swelling is likely to occur at the sting. If the swelling is severe, you may want to give your dog some Benadryl. Do this with caution, as the medication can cause drowsiness. Dogs usually fair well with one milligram per pound of body weight. If the swelling occurs in the face, they may have difficulties breathing. Open up their airways as much possible and head to the vet for medication that can decrease swelling. Your precious pup can experience eye injuries a number of ways. Physical injuries from attacks should be treated by a qualified veterinarian. To help calm down the pain on the way to your vet's office, apply a cold compress. If the injury is caused by exposure to toxic chemicals, utilize an eye wash solution. The sterilized saline can flush out chemicals to provide relief without causing any additional harm. Alternatively, you can use clean distilled water. Any chemical that's harmful to humans is very dangerous for dogs. This includes household cleaners, pesticides, and much more. Dogs can experience injury from direct contact and consumption. With contact injuries, your dog is at risk for chemical burns. As mentioned earlier, you need to use water or a sterile flush to get rid of it as soon as possible. If your dog has consumed poison, you should contact the Animal Poison Control Center as soon as possible. Gather information about the poison and collect samples if possible. Depending on the particular toxin, you may have to induce vomiting. This can be done by feeding your dog a small amount of hydrogen peroxide. The exact amount depends on your dog's weight. Whether you induce vomiting or not, you need to bring your pup to the vet for professional care. Dogs are curious creatures that will try to eat anything that looks even remotely appetizing. Unfortunately, this often leads to choking. Signs of choking include coughing, pawing at the mouth, and a blue color appearing on the lips and tongue. When this occurs, your dog is having difficulty breathing. You need to act fast. It's best to administer first-aid as soon as possible and even on the way to the veterinarian's office. Look into your dog's mouth to see if an object is visible. If it is, use pliers to carefully grab onto it and remove it from their throat. Remain calm and avoid pushing it further down their airway. If that doesn't work, administer CPR to create a burst of air that can dislodge the item. Bleeding can occur inside or outside the body. Both are serious issues that should be dealt with by a professional. Internal bleeding is often caused by organ problems or ruptured blood vessels. The bleeding may manifest itself in your dog's urine or feces. The blood may also exit through the nostrils or mouth. If left untreated, internal bleeding can eventually lead to hemorrhagic shock and organ failure. The best thing to do is wrap your dog in a blanket to keep them warm and take them to the vet as soon as possible. External bleeding is caused by physical damage. When this occurs, you need to stop the bleeding and seek professional care. Wrap the injury in thick gauze and apply firm pressure for at least three minutes. This will give the blood time to clot so that the flow stops. In severe cases, you may need to apply a tourniquet. This often pertains to injuries on the legs. Use an elastic band or gauze to cut off circulation. Place the tourniquet above the wound. Release pressure for a few moments if the tourniquet is on for more than 15 minutes. 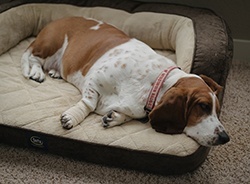 Bloat, also known as Gastric Dilation-Volvulus or gastric torsion, is an issue that affects larger dogs. It often occurs when the dog eats too much food in a short amount of time. This results in the buildup of gas. The stomach will then twist. If left untreated, the issue can lead to death. Symptoms include lethargy, gagging, difficulty breathing, and a tight stomach. There's no first-aid treatment available for the condition. The best thing you can do is to take them to the vet as soon as you suspect that your dog has bloat. Strokes occur when parts of the brain don't receive adequate blood flow from the heart. It can be a life-changing event for your dog. When your dog suffers a stoke, you need to keep them calm. Signs of stroke include rapid eye movement, sudden difficulty walking, and vomiting. Sit with your dog and stay with them until the stroke is over. You should also elevate their head to relieve pressure. Move the head upward and speak to your canine companion softly to make them feel at ease. Once the stroke is over, supply them with plenty of water and head to the vet immediately. Seizures can be caused by a multitude of things. During a seizure, your dog may collapse, twitch, jerk around, and even lose consciousness. There's not much you can do during the event to help your dog other than keep them safe from external harm. Keep them away from furniture and other obstacles. However, you should never hold their body down and restrain them. During the seizure, keep track of time. Some seizures can last only a few moments while others can last upwards of three minutes. In some cases, your dog may experience multiple seizures that get progressively worse. Keep track of time so that you can provide your vet with as much information about the event as possible. After the ordeal is over, wrap your dog in a blanket to keep them warm, comfort them to prevent unnecessary stress or anxiety, and head to the nearest vet. This issue typically affects dogs that have shorter legs and longer bodies. However, it can also affect large dogs. Your canine companion may be experiencing significant pain due to hip dysplasia or complete paralysis. The only way to know for sure is to get a diagnosis from the vet. If your furry friend has suddenly lost control of their hind legs, create a sling or stretcher with a blanket. Avoid moving the legs too much or applying any unnecessary pressure. Be as gentle as possible to avoid pain or agitation. While it's not uncommon for dogs to skip meals or drinks intermittently, refusing to drink water for a full day may be a sign of a serious underlying issue. If you ignore the problem your dog may also become dehydrated. Before your dog reaches the 24-hour period, try to persuade your dog to drink. You can try moving the dish to a new spot, giving the bowl a good cleaning, providing fresher water, or mixing it with food. If that doesn't work, go to the vet. They'll perform a thorough inspection to find out what's going on. The vet will also be able to supply your dog with fluids to prevent dehydration. Dogs will usually get comfortable with their normal routine and stick with it. They'll pass stool and urinate at the same time as long as you let them. If you've noticed that your pooch can't urinate or poop, you may have a serious problem on your hands. It may indicate problems with their bladder or a blockage in their digestive tract. Supply them with plenty of water. In some cases, water can alleviate pain and make things easier coming out. If that doesn't work, seek professional help. If your dog loses consciousness, you need to check their vital signs. Fainting, also called a syncopal episode, can be caused by a number of things. You should contact your vet and record as much information as possible. If they remain unconscious, lay them on one side and monitor their breathing, heartbeat, and pulse. Administer CPR if breathing becomes irregular. You should also keep their head level with the rest of their body to keep their airways clear. Shock is a common issue that affects anxious or stressed dogs. It typically occurs after moments of fear and can become life-threatening without proper treatment. Some common signs of shock include shallow breathing, irregular pulse, and dazed eyes. Have your dog lay down on one side and feel their pulse. Prevent your pooch from running around or moving too much. If needed, wrap them up in a warm blanket. It's also a good idea to stay close and speak to them in a friendly tone to keep them comfortable as you make your way to the vet. Severe pain can be difficult to pinpoint. Usually, dogs will cry to their owners or make physical gestures that suggest that they're suffering. Unfortunately, that doesn't give you a clear indication of where the pain is localized. If your dog is in significant pain, you'll know it. You should head to a vet as soon as possible. If you have a slight idea of where the pain is, avoid touching the area. Keep your pooch comfortable and apply a muzzle if your dog is being skittish or uncontrollable. Hypothermia is caused by exposure to cold temperatures. Depending on the severity, your dog may start to shiver, have difficulty breathing, become less alert, lose consciousness, or even fall into a coma. If they're exhibiting signs of hypothermia, bring them out of the cold as soon as possible. Place them in a heated room but not directly in front of a fire. Instead, use warm blankets to raise their body temperature. If you have an electric blanket, use that. Alternatively, you can fill a bottle with hot water, wrap it in a cloth, and place it against their abdomen. You should also visit a vet to ensure that serious damage hasn't occurred. Contrary to popular belief, it doesn't take that long for dogs to experience heatstroke when they're exposed to high temperatures. They have to work much harder to regulate their body temperature. You may notice heavy panting, drooling, and lethargy. When this occurs, you need to bring them out of the heat as soon as possible. The best way to bring their temperature down is to head into a nice air-conditioned room. If you can't make your way inside, bring your pup out of the sun. Put them under adequate shade and provide them with plenty of water to rehydrate. You can also apply a cold and wet towel over their head and body. Dip the towel into cold water and ring it out every few minutes to keep the towel cold. Alternatively, you can apply the cold water directly to their body. Pour it onto their torso and hind legs. Use your hands to massage the legs and spread the water around. While many accidents and injuries can't be avoided, you can certainly reduce the risks of lasting issues by being prepared. Adequate preparation can mean the difference between life and death. Knowing what to do when emergencies occur and being proactive can help you take action to minimize pain and get your dog the care they need. You should always know where to take your canine companion when they need professional care. Not every veterinarian is capable of providing service around the clock. If your vet doesn't offer 24/7 emergency care, find a clinic that does. There are many animal hospitals that have staff available in the middle of the night, during weekends, and even on holidays. You should familiarize yourself with the clinic's location and have their number on hand. This also applies to travel destinations. It's not uncommon for accidents to happen in places that you and your dog are unfamiliar with. Before hitting the road, do some research and find places nearby that you can always take your dog. A first-aid kit will supply you with all the things you need to care for your pet at a moment's notice. You likely have a first-aid kit for you and your family, so why not create one for your pet? While many of the items in your dog's kit will be similar, it's good to keep them separate and stock up on items that are designed for dogs. CPR, or cardiopulmonary resuscitation, is an important skill that can ultimately save your dog's life. It can be used to revive your pet after they've lost consciousness or start choking. CPR involves rescue breathing and chest compressions. While it may be similar to human CPR, you need to know how to adapt the procedure safely to a dog's body. It's also important to know how to time the various steps for your dog's particular ailment. Luckily, there are many resources available that give you the tools you need to perform the procedure confidently. With that being said, CPR is always best performed by a professional. Improper CPR can lead to significant injuries and future complications. It can lead to fractured rib bones and damaged organs. CPR should only be performed when it's absolutely needed and you should never do it to a healthy dog. As much as owners don't want to think of their dogs in pain, it's good to be prepared for the worst-case scenario. Despite their carefree attitudes and fun-loving lifestyles, dogs aren't indestructible. Knowing what to do and where to go will ensure that you're equipped to give your dog care when they need it most.